108 items in this album on 6 pages. 1939 sketch of plans for the OS2U-1 Kingfisher Line of OS2U Kingfisher float planes running up their engines prior to a practice flight at a training base in the United States, 1939-40. Wheeled version of an OS2U-2 Kingfisher being prepared for test flights at the Vought factory in Stratford, Connecticut, United States, 1940. 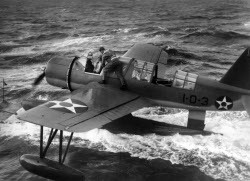 Naval Aviation Cadets from the Naval Air Station at Corpus Christi practicing formation flying in Chance-Vought OS2U Kingfisher float aircraft, Texas, United States, circa early 1940.